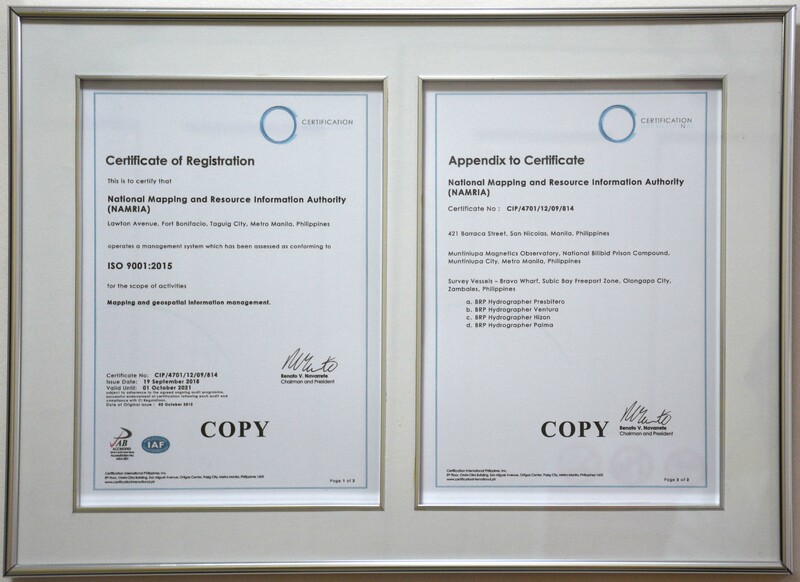 NAMRIA reached another milestone in 2018 in its successful migration from International Organization for Standardization (ISO) 9001:2008 standard on Quality Management Systems (QMS) to ISO 9001:2015 for mapping and geospatial information management, as the scope of activities. NAMRIA’s rigorous journey for its ISO 9001:2015 certification started in January 2017 with the agency’s request, authorized by NAMRIA Administrator, Usec. Peter N. Tiangco, for the services of the Development Academy of the Philippines for technical guidance on the transition. The culminating two-day assessment was conducted on 24-25 July 2018 by SOCOTEC Certification International Philippines, Inc. NAMRIA’s ISO 9001:2015 certification took effect on 19 September 2018 and is valid until 01 October 2021, subject to satisfactory results of annual surveillance audits.